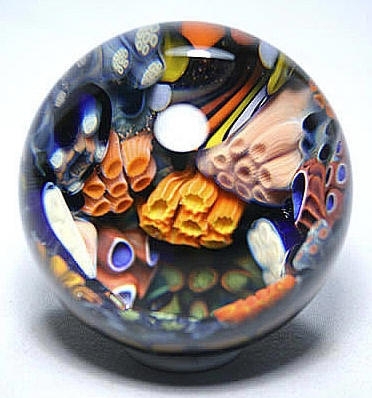 GlassMaster Kevin O'Grady, one of a kind, collectable marbles. These marbles are in high demand. Each one is unique therefore if you fall in love with one, purchase it quickly, as there will never be an exact duplicate. Scott Pernicka new glass marble artist. Check out his marvelous designs and the sheer brilliance of each marble. With a style of his own. these marbles can't be beat for their pure beauty. James Yaun - T C Glass Arts. Our newest artist..
Glass Artist Jeremy Sinkus, self taught making his sea life creations in borosilicate glass. Glass Artist Raj Kommineni unique design of Opal Basket Marble. Sand blasted finish with multiple clear glass windows & pearl in center. Viewed at different angles, there appears to be several opals. The interior has colorful floral design, orange & white looking three dimensional. Outside surface done with soft subtle rounded design that shows through to the interior wall. A must have for serious collectors. Approx. 2.25" diameter. Lucite stand included. Artist signed RK and dated. Glass Artist Raj Kommineni unique design of Opal Basket Marble. 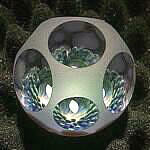 Sand blasted finish, multiple clear glass windows & white opal in center. Viewed at different angles, there appears to be several opals. The interior has colorful floral design, green and blue looking three dimensional. Outside surface done with soft subtle rounded design showing through to the interior wall. A must have for serious collectors. Approx. 2.25" dia. Artist signed RK. 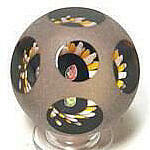 Glass Artist Raj Kommineni unique design of Opal Basket Marble Medium. 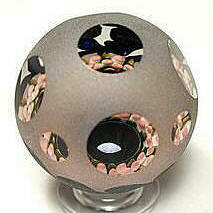 Sand blasted finish with multiple clear glass windows & pearl in center. Viewed at different angles, there appears to be several opals. The interior has colorful floral design, orange & white looking three dimensional. Outside surface done with soft subtle rounded design that shows through to the interior wall. A must have for serious collectors. Approx. 2.45" diameter. Lucite stand included. Artist signed RK and dated. Glass Artist Raj Kommineni unique design of Opal Basket Marble Medium. Sand blasted finish, multiple clear glass windows & pearl in center. Viewed at different angles, there appears to be several opals. The interior has colorful floral design, orange,purple & white looking three dimensional. Outside surface done with soft subtle rounded design showing through to the interior wall. A must have for serious collectors. Approx. 2.25" dia. Artist signed RK. 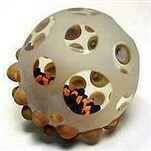 Glass Artist Raj Kommineni unique design of Opal Basket Studded Marble. Sand blasted finish with multiple clear glass windows & pearl in center. Viewed at different angles, there appears to be several opals. Interior has colorful floral design, orange & white looking three dimensional. Outside surface done with soft subtle rounded design that shows through to the interior wall. A must have for serious collectors. Approx. 2.50" diameter. Artist signed RK and dated. 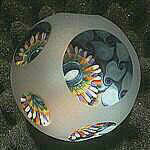 GlassMaster Kevin O'Grady's unique, "One of a Kind" creation of Coral Reef - Tide Pool Vortex marble. Teaming with sea-life of anenomies and coral, Kevin has produced another masterpiece. Artist signed & dated, approximately 2.80" diameter.